Although the laboratory molecular approach in Mood Disorders (MD) has currently no clear diagnostic value, the need for its use in an “omics comprehension” of this illness has become more and more obvious. In fact, MD and also bipolar disorders and sub-threshold mania conditions are regulated in the patient by multifactorial, genetic and epigenetic factors [1-3], in which transcriptomics, proteomics, metabolomics and environmental conditions work closely together at disease onset and during its progression . This is the context in which it is hoped that further integration of these techniques will yield a more comprehensive understanding of mood disease etiology and its biological pathways. In recent years, the use of Genome-Wide Association Studies (GWAS) has provided an extensive investigation of genomes in healthy and sick patients and these results could thus prove promising in the future for an extensive comprehension of BD-associated genetic features [5, 6]. Research carried out on a very large human population has highlighted numerous genetic variants/mutations in both coding and in non-coding gene regions. Some of these appear promising for suggesting a significant association between MD and DNA changes [7, 8]. This work only focuses on a Single Nucleotide Polymorphism (SNP) located in the CACNA1C gene (rs1006737), which is one of the most studied and replicated mutations associated to mood disorders. We are aware that this is an arguable choice, but a study of all the mutations in the candidate genes reported so far is beyond the scope of this article. In fact, the aim of this work is the valuation in silico of a molecular probe able to detect in a short time the allelic variations previously described in rs1006737 as regards the risk of MD for this genic region. This gene, located in chromosome 12, encodes an alpha-1 subunit of a voltage-dependent calcium channel that mediates the influx of calcium ions into the cell, upon membrane polarization. It consists of 24 segments positioned in a cell transmembrane space, able to form a pore for calcium transfer. This molecular structure is responsible for calcium influx in response to membrane depolarization, thereby regulating different intracellular processes such as neurotransmission and gene expression in many different cells and neurons. This activity results as being essential for coupling electrical signals on the cell surface to physiological events in the cells [9, 10]. The complete calcium channel is structured as a complex of alpha-1, alpha-2/delta, beta, and gamma subunits in a 1:1:1:1 ratio. As has been previously described in other publications, an alternative splicing also exists that results in numerous transcript variants which encode different proteins, but no such products result for functional ion channel subunits . In the gene sequence corresponding to GenBank accession n. NG_008801, CACAN1C takes up a region of 728,273 bp and 51 exons Fig. (1). 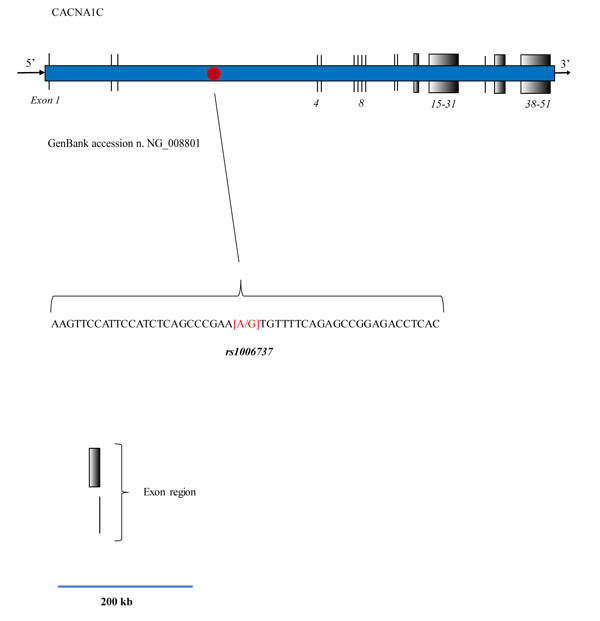 In variant 4, the mRNA is about 13500 bp long (Gen Bank accession NM_001129830), Fig. (1). To date, this variant represents the most cited and studied genetic risk for bipolar disorders, but it also confers a risk of recurrent major depression and schizophrenia [12-18]. As shown in Fig. (1), the SNP is located in the intronic region of CACNA1C, Fig. (1). The A allele is thought to be a risk factor and various studies have shown its odds ratio as ranging between 1.18-1.07 [19-21]. Some researchers have hypothesized that this variant is able to influence gene expression, and others have demonstrated an effective variation of CACNA1C mRNA in post-mortem brain studies. The frequency of this allele appears to be strictly correlated to the ethnic origin of the analyzed population, for example, about 54% in African descent while 5% in the Asian population. Moreover, different discrepancies exist as regards the interpretation of molecular data in the clinical findings, which is also due to the result of these allelic differences in different ethnical groups and an admixture of these in some countries, e.g. in the USA population. Thus, some researchers have found no effects, while others have reported a significant reduction in cognitive function [16, 22, 23], but only in individuals who carried the homozygous A allele. Due to the lack of clinical specificity, such controversies require further and extensive studies, and in particular, this nucleotide profile could be detected by faster, less expensive molecular procedures than those used in current molecular analysis. In light of these facts, we thus performed an in silico study to investigate the suitability of Fluorescence Resonance Energy Transfer (FRET) technology for use in DNA probes to detect G-A variants in rs1006737 in human samples. FRET phenomena are observable when two dye molecules are in close proximity (about 1-5 nucleotides apart), and in this condition, due to an energy transfer from one molecule (donor) to the other (acceptor), the latter may show instability with photon emission . FRET technology has been used to investigate a variety of biological phenomena that produce changes in molecular proximity, such as nucleotide variations in a DNA fragment [25-27]. FRET dyes could be applicable in DNA probes structured as shown in Fig. (2). Two fluorophores are bound in 2 different DNA fragments that are complementary to the DNA sequence under study, the first one in the 3' position of the fragment and the second one in the 5' position of the other adjacent oligonucleotide. These dyes were chosen so that the emission spectrum of one significantly overlaps with the excitation spectrum of the other. During FRET, the donor fluorophore, excited by a light source, transfers its energy to an acceptor fluorophore when positioned in the direct vicinity of the former, thus the probe system consists of two oligonucleotides labeled with two different fluorescent dyes. During a PCR reaction, the oligonucleotides hybridize to complementary regions of the DNA target and the fluorophores, which are coupled to the oligonucleotides, are in close proximity, Fig. (2). The donor fluorophore (F1) is excited by an external light source from the PCR thermocycler and then passes part of its energy to the adjacent acceptor fluorophore (F2). The latter dye emits light at a different wavelength which can then be detected and measured by a PCR machine. This technique can be applied to genotype variants in rs1006737 by using melting curve procedures during the PCR reaction and the subsequent melting temperature by the melting peak interpretation, which is now evaluable by means of online tools such as the DINAMelt program . Fig (1). Position of rs 1006737 in the CACAN1C gene associated to mood disorders, following recent genome-wide association studies (GWAS). Fig (2). 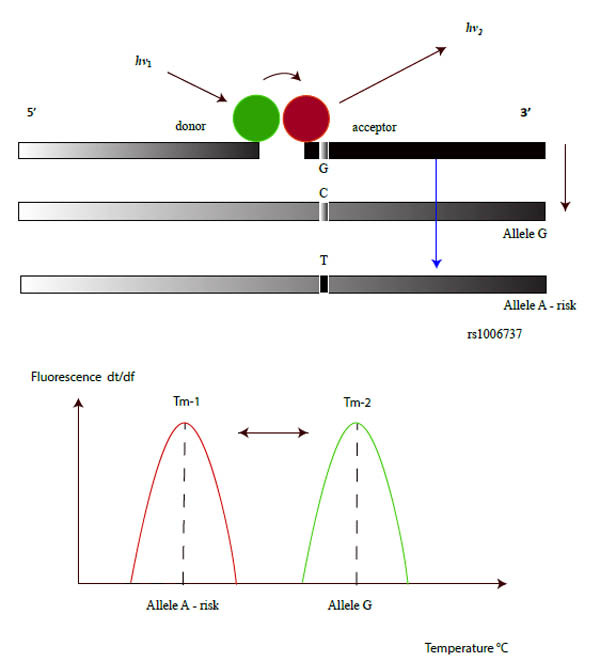 Schematic representation of FRET probe structure and the possible melting peak array with rs1006737 alleles. We analyzed the CACNA1C 480 bp fragment corresponding to GenBank accession n. NG_008801 (from nucleotide 270121 to 27600) indicating the normal allele (G), Fig. (1). This DNA sequence was analyzed by using the “mfold Web Server” tools available on line from the RNA Institute (University at Albany, State University of New York), http://www.albany.edu/rna/. The folding of the sequence was studied to avoid the presence of high energy DNA loops able to interfere with FRET probe positioning during the PCR reaction . Subsequently, DINAMelt was used to design the probe and to study the prediction of the melting temperatures (Tms) in the presence of the different rs1006737 alleles G and A. Fig (3). Sequence and structure of the FRET system valuated in this study. The typical ROCHE Dye, Fluorescein and LC 640, are indicated in the figure, PHO - phosphate. The graph represents the tendency curve indicating the donor probe length and Tm differences between the A and G variants in rs1006737. The range of Tm events depends on different conditions: (i) probe length, (ii) GC% content, (iii) the molar concentration of monovalent cations, (iv) steric hindrance of the fluorophore bound to the oligo . The DINAMelt tool was used with chemical and physical parameters for a PCR reaction ([Na]= 50 mM and [Mg] = 2 mM). The temperature range was set from 50°C to 100°C. The theoretical concentration of the probes was 20 µM [27, 28]. The Tm values compared to the length of the acceptor probe for both alleles A and G has been evaluated, they are shown in Fig. (3). We designed a real time PCR reaction by using the Oligo 6 and Oligo 4 programs (Med.Probe, Oslo, Norway) as described in other publications [30-47]. Some authors have reported real time PCR procedures, by using TaqMan probes, to detect rs1006737 SNP in the CACNA1C gene . This molecular probe consists of an oligonucleotide with a fluorescent reporter at one end, and a fluorescence quencher molecule at the opposite end of the probe. The proximity of these fluorophores prevents the emission of fluorescence, but the hydrolyzation of the probe, caused by the 5' to 3' exonuclease activity of the Taq polymerase during the PCR reaction, releases the reporter and thus allows fluorescence emission. Although this procedure is easy to use and has been indicated by many authors for genotyping, other molecular works carried out with reconstruction experiments, have demonstrated its limited use in terms of accurate discrimination in SNP detection, especially as far as heterozygotes are concerned. In fact, this condition has proved to be a problematic point in PCR based genotyping, in this case with the AG allele. An alternative method in rs1006737 genotyping with greater specificity/selectivity could be to use a molecular procedure based on FRET probes. In comparison with traditional or recent molecular methods, such as RFLP or DNA sequencing procedures, this approach resulted as being faster, less expensive, simpler and accurate . In FRET technologies classic Dye chemistry are composed from fluorescein isothiocyanate (F1) at 3′ end of upstream probe, while the downstream probe (acceptor) is labeled with the fluorophore Red 640 (F2), Fig. (2), and (3). A single G-A variation can be detected in rs1006737 because the nucleotide change in the DNA target destabilize binding of the acceptor probe and, hence, cause a characteristic decrease in the melting temperature (Tm). In the PCR apparatus this result is displayed by a melting peak shift, by monitoring the F2 fluorescence during sampling heating, Fig. (4). Our work, which was exclusively performed in silico, has indicated a good possibility of allelic discrimination for this gene region by melting temperatures evaluation. Fig (4). In silico forecast analysis for the allelic discrimination between A and G alleles for SNP rs1006737 by using FRET probes in real time PCR after melting curve real time PCR protocol. Fig. (3) summarizes results from studies that have sought to detect the differences between melting temperature Tms in the presence of the G or A allele in SNP rs1006737 as compared to the respective nucleotide length of the acceptor probe. In accordance with the data obtained by the DINAMelt program, the optimal length was assessed at 16 nucleotides when the ΔTm resulted as being 5°C, a value which could be sufficient to discriminate between the two allelic profiles. In particular this approach it may be able detect the allele A, which has been indicated as a risk in bipolar disorders and Schizophrenia . 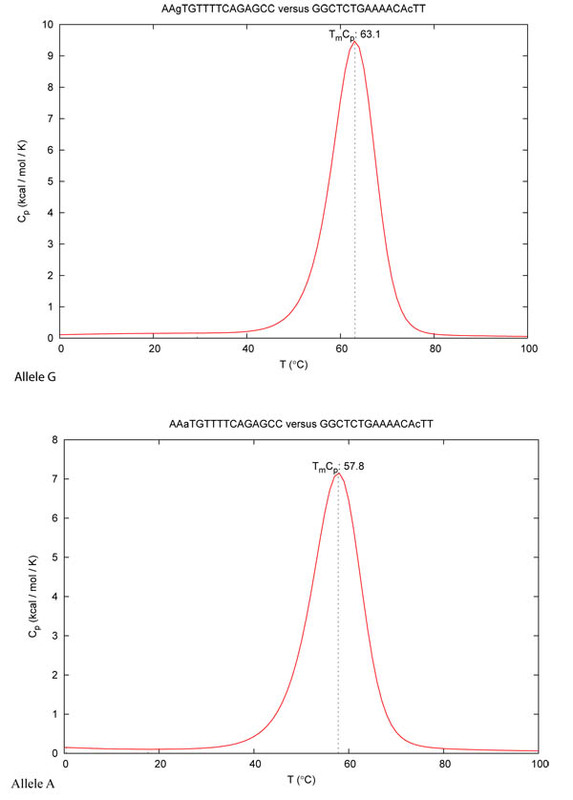 In our previous works we have assessed that the maximum difference in Tm between: (i) theoretical and (ii) real values, using real time PCR procedures by using different FRET probes, corresponds to 0.5°C max [25, 26], in these publications, we also noted that a good rate of sensitivity/specificity of this method was observed with two rounds of DNA amplification . In fact Table (1) indicates the theoretical PCR oligos designed for a nested PCR suitable for this FRET SNP detection. Fig. (4) shows the melting peaks obtained with DINAMelt, simulating a PCR platform such as a LightCycler (Roche). The mutation analysis by Next Generation Sequencing or by real time PCR with TaqMan probes are a widely used method to differentiate A and G allele in SNP rs1006737. However in comparison with proposed FRET method the first one is a relatively time-consuming and many expensive procedure (about 100-200 fold higher) and it require a high minimum number of samples for to be cost efficiency . TaqMan could be unable to distinguish the presence of both G-A alleles with errors in specificity and selectivity (heterozygous profile) . Table 1. Oligonucleotides designed for a nested real time PCR for rs1006737. Theoretical annealing temp. = 50°C for both reactions. Thus, this procedure could be achievable within a molecular procedure able to detect the nucleotide variation in rs1006737 by means of a fast-real time PCR laboratory protocol. Although the implications of our results are theoretical, we are able to assert that FRET probes could be employed in laboratory tests for the detection of rs1006737 alleles, for example, by using patient’s saliva DNA. In further studies, it could be interesting to evaluate whether other SNPs in CACANA1C, or in other MD-related genes, are detectable by different FRET oligos. This could be a molecular model for a non-expensive routine procedure for multiple MD-related SNPs, which have already been described in clinical studies with more complex molecular analyses, such as those using Next Generation Sequencing (NGS). The authors confirm that the article content has no conflict of interest. We thank Dr. Giuseppe Serafi for valuable discussions and insights on molecular procedures. Carta MG, Angst J. Screening for bipolar disorders: A public health issue. J Affect Disord 2016; 205: 139-43. Carta MG, Norcini-Pala A, Moro MF, et al. Does mood disorder questionnaire identify sub-threshold bipolarity? Evidence studying worsening of quality of life. J Affect Disord 2015; 183: 173-8. Carta MG, Tondo L, Balestrieri M, et al. Sub-threshold depression and antidepressants use in a community sample: Searching anxiety and finding bipolar disorder. BMC Psychiatry 2011; 11: 164. Carta MG. Social change and increasing of bipolar disorders: an evolutionary model. Clin Pract Epidemol Ment Health 2013; 9: 103-9. Kato T. Recent progress in mood disorder research Brain and nerve = Shinkei kenkyu no shinpo 2012; 64: 119-29. Goes FS, Hamshere ML, Seifuddin F, et al. Genome-wide association of mood-incongruent psychotic bipolar disorder. Transl Psychiatry 2012; 2: e180. Ren H, Guan L, Zhao L, et al. Contribution of genes in the GABAergic pathway to bipolar disorder and its executive function deficit in the Chinese Han populationAmerican journal of medical genetics Part B, Neuropsychiatric genetics : The Off Publ Int Soc Psychiatr Genet 2017; 177(1): 50-67. Kerner B. Genetics of bipolar disorder. Appl Clin Genet 2014; 7: 33-42. Tsien RW, Hess P, McCleskey EW, Rosenberg RL. Calcium channels: Mechanisms of selectivity, permeation, and block. Annu Rev Biophys Biophys Chem 1987; 16: 265-90. Glossmann H, Striessnig J. Molecular properties of calcium channels. Rev Physiol Biochem Pharmacol 1990; 114: 1-105. Fukuyama M, Ohno S, Wang Q, Shirayama T, Itoh H, Horie M. Nonsense-mediated mRNA decay due to a CACNA1C splicing mutation in a patient with Brugada syndrome. Heart Rhythm 2014; 11(4): 629-34. Fabbri C, Corponi F, Albani D, et al. Pleiotropic genes in psychiatry: Calcium channels and the stress-related FKBP5 gene in antidepressant resistance. Prog Neuropsychopharmacol Biol Psychiatry 2018; 81: 203-10. Soeiro-de-Souza MG, Lafer B, Moreno RA, et al. The CACNA1C risk allele rs1006737 is associated with age-related prefrontal cortical thinning in bipolar I disorder. Transl Psychiatry 2017; 7(4): e1086. Fatima A, Farooq M, Abdullah U, et al. Genome-Wide Supported Risk Variants in MIR137, CACNA1C, CSMD1, DRD2, and GRM3 contribute to schizophrenia susceptibility in pakistani population. Psychiatry Investig 2017; 14(5): 687-92. Fabbri C, Boriani G, Diemberger I, et al. Electrocardiogram alterations associated with psychotropic drug use and CACNA1C gene variants in three independent samples. Basic Clin Pharmacol Toxicol 2017; 120(5): 482-90. Uemura T, Green M, Warsh JJ. CACNA1C SNP rs1006737 associates with bipolar I disorder independent of the Bcl-2 SNP rs956572 variant and its associated effect on intracellular calcium homeostasis. The world j Biol psychiatry 2016; 17: 525-34. Rao S, Yao Y, Zheng C, et al. Common variants in CACNA1C and MDD susceptibility: A comprehensive meta-analysis American journal of medical genetics Part B, Neuropsychiatr Genet 2016; 171(6): 896-903. Woon PS, Sum MY, Kuswanto CN, et al. CACNA1C genomewide supported psychosis genetic variation affects cortical brain white matter integrity in Chinese patients with schizophrenia. J Clin Psychiatry 2014; 75(11): e1284-90. Ferreira MA, O’Donovan MC, Meng YA, et al. Collaborative genome-wide association analysis supports a role for ANK3 and CACNA1C in bipolar disorder. Nat Genet 2008; 40(9): 1056-8. Liu Y, Blackwood DH, Caesar S, et al. Meta-analysis of genome-wide association data of bipolar disorder and major depressive disorder. Mol Psychiatry 2011; 16(1): 2-4. Identification of risk loci with shared effects on five major psychiatric disorders: A genome-wide analysis. Lancet 2013; 381(9875): 1371-9. Ou X, Crane DE, MacIntosh BJ, et al. CACNA1C rs1006737 genotype and bipolar disorder: Focus on intermediate phenotypes and cardiovascular comorbidity. Neurosci Biobehav Rev 2015; 55: 198-210. Backes H, Dietsche B, Nagels A, et al. Genetic variation in CACNA1C affects neural processing in major depression. J Psychiatr Res 2014; 53: 38-46. Didenko VV. DNA probes using fluorescence resonance energy transfer (FRET): Designs and applications BioTechniques ;31:1106-16, 18, 20-1 2001. Salati F, Meloni M, Fenza A, Angelucci G, Colorni A, Orrù G. A sensitive FRET probe assay for the selective detection of Mycobacterium marinum in fish. J Fish Dis 2010; 33(1): 47-56. Orrù G, Santis PD, Solinas F, Savini G, Piras V, Caporale V. Differentiation of Italian field and South African vaccine strains of bluetongue virus serotype 2 using real-time PCR. J Virol Methods 2004; 122(1): 37-43. Meacci F, Orrù G, Iona E, et al. Drug resistance evolution of a Mycobacterium tuberculosis strain from a noncompliant patient. J Clin Microbiol 2005; 43(7): 3114-20. Markham NR, Zuker M. DINAMelt web server for nucleic acid melting prediction. Nucleic Acids Res 2005; 33(Web Server issue): W577-81. Arcadu B, Orrù M, Piga R, Orrù G. Designing of sequencing assay assisted by capillary electrophoresis based on DNA folding analysis: an application to the VCAM1 gene. Electrophoresis 2012; 33(7): 1215-9. Orrù G, Marini MF, Ciusa ML, et al. Usefulness of real time PCR for the differentiation and quantification of 652 and JP2 Actinobacillus actinomycetemcomitans genotypes in dental plaque and saliva. BMC Infect Dis 2006; 6: 98. Montaldo C, Mastinu A, Quartuccio M, Piras V, Denotti G, Pisano E, et al. Detection and genotyping of human papillomavirus DNA in samples from healthy Sardinian patients: A preliminary study. J oral Pathol Med 2007; 36: 482-7. Orru G, Coghe F, Faa G, Pillai S, Manieli C, Montaldo C, et al. Rapid multiplex real-time PCR by molecular beacons for different BRAF allele detection in papillary thyroid carcinoma. Diagnostic molecular pathology. The Am j Surg Pathol part B 2010; 19: 1-8. Pilo C, Tedde MT, Orrù G, Addis G, Liciardi M. Brucella suis infection in domestic pigs in Sardinia (Italy). Epidemiol Infect 2015; 143(10): 2170-7. Orrù G, Ferrando ML, Meloni M, Liciardi M, Savini G, De Santis P. Rapid detection and quantitation of Bluetongue virus (BTV) using a Molecular Beacon fluorescent probe assay. J Virol Methods 2006; 137(1): 34-42. Isola D, Pardini M, Varaine F, et al. 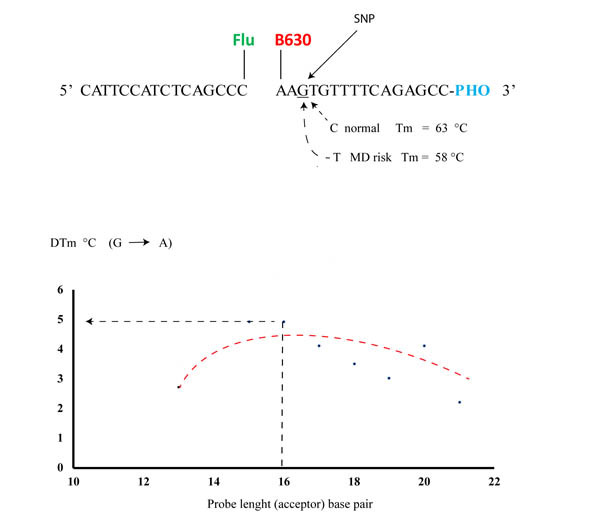 A Pyrosequencing assay for rapid recognition of SNPs in Mycobacterium tuberculosis embB306 region. J Microbiol Methods 2005; 62(1): 113-20. Orrù G, Masia G, Orrù G, Romanò L, Piras V, Coppola RC. Detection and quantitation of hepatitis E virus in human faeces by real-time quantitative PCR. J Virol Methods 2004; 118(2): 77-82. Wright EA, Di Lorenzo V, Trappetti C, et al. Divergence of a strain of Pseudomonas aeruginosa during an outbreak of ovine mastitis. Vet Microbiol 2015; 175(1): 105-13. Piludu M, Piras M, Pichiri G, et al. Thymosin beta 4 may translocate from the cytoplasm in to the nucleus in HepG2 cells following serum starvation. An ultrastructural study. PLoS One 2015; 10(3): e0119642. Brandas V, Orrù G, Carraro V, et al. Recovery of Staphylococcus aureus in Gray Mugil cephalus Roe (Bottarga): Investigation by an Integrated Cultural/Molecular Approach. J Food Sci 2015; 80(6): M1285-90. Abbate GM, Caria MP, Montanari P, et al. Periodontal health in teenagers treated with removable aligners and fixed orthodontic appliances. J orofacial orthopedics Fortschritte der Kieferorthopadie 2015; 76(3): 240-50. Ferrando ML, van Baarlen P, Orrù G, et al. Carbohydrate availability regulates virulence gene expression in Streptococcus suis. PLoS One 2014; 9(3): e89334. Demurtas P, Orrù G, Coni P, et al. Association between the ACE insertion/deletion polymorphism and pterygium in Sardinian patients: A population based case-control study. BMJ Open 2014; 4(10): e005627. Montaldo C, Erriu M, Giovanna Pili FM, et al. Microbial changes in subgingival plaque and polymicrobial intracellular flora in buccal cells after fixed orthodontic appliance therapy: A preliminary study. Int j Dent 2013; 679312. Nemolato S, Restivo A, Cabras T, et al. Thymosin β 4 in colorectal cancer is localized predominantly at the invasion front in tumor cells undergoing epithelial mesenchymal transition. Cancer Biol Ther 2012; 13(4): 191-7. Meloni M, Angelucci G, Merella P, et al. Molecular characterization of Anisakis larvae from fish caught off Sardinia. J Parasitol 2011; 97(5): 908-14. Erriu M, Boscarelli F, Peluffo C, et al. A rapid sample method for HLA haplotype typization. A preliminary study on celiac patients. Minerva Stomatol 2010; 59(9): 477-87. Orru G, Faa G, Pillai S, et al. Rapid PCR real-time genotyping of M-Malton alpha1-antitrypsin deficiency alleles by molecular beacons. Diagnostic molecular pathology. The Am j Surg Pathol part B 2005; 14: 237-42. Frazier TW, Youngstrom EA, Frankel BA, et al. Candidate gene associations with mood disorder, cognitive vulnerability, and fronto-limbic volumes. Brain Behav 2014; 4(3): 418-30. Bernard PS, Wittwer CT. Homogeneous amplification and variant detection by fluorescent hybridization probes. Clin Chem 2000; 46(2): 147-8. Green EK, Grozeva D, Jones I, et al. The bipolar disorder risk allele at CACNA1C also confers risk of recurrent major depression and of schizophrenia. Mol Psychiatry 2010; 15(10): 1016-22. Yesilkaya H, Meacci F, Niemann S, et al. Evaluation of molecular-Beacon, TaqMan, and fluorescence resonance energy transfer probes for detection of antibiotic resistance-conferring single nucleotide polymorphisms in mixed Mycobacterium tuberculosis DNA extracts. J Clin Microbiol 2006; 44(10): 3826-9.